Stripe rust is a disease caused by a pathogenic fungus. The stripe rust pathogen is further classified into formae speciales (forms) based on the genera and species of the host plant that it primarily infects. Some formae speciales have the ability to infect one or more other host plants. * The stripe rust formae speciales on Kentucky bluegrass and orchardgrass have recently been renamed as Puccinia pseudostriiformis and Puccinia striiformoides, respectively (Lui, M., Hambleton, S. 2010. Taxonomic study of stripe rust, Puccinia striiformis sensu lato, based on molecular and morphological evidence. Fungal Biology 114:881-899.). ** Wellings, C. R. 2011. Global status of stripe rust: a review of historical and current threats. Euphitica. 179: 129-141. Isolates of a particular forma specialis of the stripe rust fungus are differentiated into races (pathotypes) based upon their virulence/avirulence on a set of selected host crop genotypes with different resistance genes. Click here to learn more about races of wheat stripe rust and barley stripe rust. 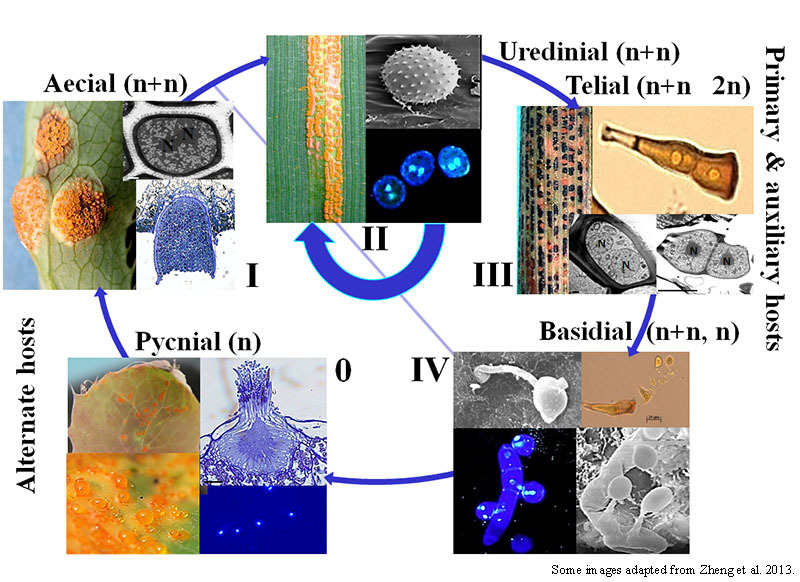 In most of the wheat-growing regions around the world, urediniopores are the only inoculum source for the initial and recurrent infection of wheat and auxiliary host plants. Although the alternate hosts were identified recently, the contribution of sexual reproduction to genetic variation and race evolution of the stripe rust pathogen (Puccinia striiformis) is largely unknown. Zheng, W., et al. 2013. High genome heterozygosity and endemic genetic recombination in the wheat stripe rust fungus. Nature Communications 4. Wang, M.N., Chen, X.M. 2013. First report of Oregon grape (Mahonia aquifolium) as an alternate host for the wheat stripe rust pathogen (Puccinia striiformis f. sp. tritici) under artificial inoculation. Plant Disease 97:839. Jin, Y., Szabo, L.J., and Carson, M. 2010. Century-old mystery of Puccinia striiformis life history solved with the identification of Berberis as an alternate host. Phytopathology 100:432-435.